When Kelly was hired, I had three major concerns about how he would make the transition. Over the years he has clearly proven that he knows how to coach, but I wondered about how he would assemble a coaching staff to compete against some of the best staffs in the country, how he would recruit nationally against those same elite recruiters, and how he would handle the media on a much bigger stage. We'll find out about the staff soon enough and should start to get some clues as to the recruiting question in the next month. In the meantime, Kelly is already showing a willingness to work with the media and not treat them as the enemy, as Charlie did on occasion when he started the job. Kelly's still in the easy honeymoon phase, but more and more it looks like he will embrace rather than shrink from the bigger media spotlight. Along those lines, Kelly recently had two sit downs with the press in order to expand upon what he said during his intro presser Q&A. Interestingly, Kelly had two separate meetings because he met with the, for lack of a better term, "internet media" separate from the more traditional print journalists. It was an interesting move that is one of the reasons I feel better about how he will handle the media. The online guys, in this case writers from Irish Sports Daily, Irish Illustrated, Blue and Gold Illustrated, and IrishEyes, have a different level of interaction with a coaching staff than the print folk like Eric Hansen of the South Bend Tribune, Brian Hamilton of the Chicago Tribune, Tony Krausz of the Fort Wayne Journal Gazette, and Tom Coyne, the local AP writer, and Kelly appears to recognize that. Case in point, Kelly was surprisingly blunt about promising more "inside scoop" for the online set assuming they stick to the facts, leave the rumor-mongering at the door, and keep the best interests of the program in mind. The later point was one I am a bit surprised he made as the criticism of recruiting sites as de facto program propaganda sites is one reason they have had a long road to universal print media and athletic department acceptance. None of the ND sites have ever fit that description in my opinion, but you can't help but notice it periodically when reading updates and interviews from other programs. Here's an excerpt of the multi-question back and forth between Kelly and the recruiting-centric online ND sites. Lou Holtz had a famous saying for us, ‘Abuse leads to restriction.’ I think the competitive nature of the media market feeds that demand to know. Contrast Kelly's "you scratch my back, I'll scratch yours" approach with the more draconian measures Charlie took that put some of the press on the defensive from the start and led in some cases to articles that appeared to take frustrations with Charlie out on the players. “I think positionally it does make a difference because you’re right, I think mentally and physically, there are a couple of positions, in particular the offensive line, that would from my experience mean that they’re probably not ready to play as true freshmen. But I’ve always believed, I’d rather play true freshmen. I’ve always had better success with a young man that plays relative to time management than if he redshirts. It’s just worked for me philosophically. "I have a different ways of categorizing as we get to know each other better. I recruit power, big skill and skill. Those are the three categories, those are the only three categories I operate out of. Power, big skill and skill. "A power player fits a profile for us. Generally, those are your linemen. Big skill is profiling out, if I could take 20 guys who are tough gentlemen who fit the profile at Notre Dame academically and were 6-foot-4, 215 or 220 pounds, you’d never be able to track whose playing where. ‘I don’t know, he just takes a bunch of those guys and some play defensive end, some play tight end, some are safeties, big skill. "Then skill obviously have a specific, specific, strength in that particular area, be it ball skills, throwing it, kicking it and I’ve always operated out of those three categories wherever I’ve been and will continue to operate out of those three categories here at Notre Dame. Moving to his meet with the print media, Kelly talked more about current players, the plans he has for the defense, and the soon to be mentioned everywhere "Camp Kelly". There doesn't appear to be a full transcript out there, but Hamilton provided most of the Q&A here and here. Again, here are some of the more interesting bits. "We''ll operate and begin our defense as a 3-4 base, but we're extremely flexible within that 3-4 structure. It allows you to be in both those fronts without substituting personnel. I felt over the past four or five years as a head coach, increasingly, running multiple personnel packages on defense took away from our skill development." "I think they're all 18- to 21-year-olds. Some of them are a little bit taller and maybe their 40 (yard dash) time is a little bit better. But they all have the same wants, needs and desires. They have to have their priorities in order. If they're more interested in their future recording contracts or what car they drive, then regardless of where they are, they're probably not going to be the right kind of guy for me." "I'm not really interested in it. We don't have to look toward that avenue." "I gauge the commitment level. I need to find out how important it is for you to be a football player at Notre Dame. It really is an opportunity for our players to show what I think are some of the most important principles of playing winning football: physical and mental toughness. It's a tough game for tough guys. And I can tell you this: it has absolutely no football applicability relative to skill development. You go into it knowing you won't leave here a better receiver, but you'll leave a tougher wide receiver." All in all, Kelly was pretty open and clearly has a plan for what he likes and does not like. Sure each new coach sounds great in his first few weeks with plans to make the team tougher, faster, and more disciplined, but when you are reading coachspeak it's always better to get more detailed answers "we're running a 3-4; we don't need transfers; recruiting will focus on national power programs early" than more vague generalities. At the very least, it gives us some specifics to look for in the coming months while we all impatiently wait for the next season to kick off. As we pick through the last bits of holiday turkey and ham and get ready for the upcoming few days of college football bowl bliss, here are a few assorted leftovers from the past few days to mull over as we all decide whether to resign or just take a leave of absence from the long upcoming stretch of holiday-less months. The big news of course is the slowly building coaching staff that Coach Kelly is hiring to help him run ND football. The only ND verified hire so far has been an excellent one as running backs coach Tony Alford was announced prior to Christmas as the lone assistant coach to make the Weis-to-Kelly transition. "I got to know Tony during our days in the Big East when he was at Louisville and I was at Cincinnati," Kelly said. "He is a tremendous teacher and a great recruiter and I'm thrilled to keep him on the coaching staff. He has consistently developed his players at every school he has coached and his passion for the game is infectious. I look forward to working closely with him." Adding to the list appears to be now former Grand Valley State head coach Chuck Martin, who according to mlive.com will be the new defensive backs coach under Kelly. It will be a definite step up for Martin, especially when it comes to the wild world of D1 recruiting, but on paper this sounds like a very good hire for a position coach. Martin knows all about the defensive backs position as he was an All-American free safety nearly 20 years ago at Millikin University (NCAA Division III College in Decatur, Ill.). As mentioned above Martin was originally hired at GVSU as the defensive backs coach back in 2000. He held that spot for three seasons and then in 2003 was promoted to the defensive coordinator position. Then in 2004 when Brian Kelly left to become the head coach of the Central Michigan Chippewas, Martin took over the same position at GVSU. During his time at GVSU as head coach Martin went an unprecedented 74-7. Martin led the Lakers to two NCAA Division II National Championships and five GLIAC titles. In total at GVSU, Martin was apart of six NCAA Division II National Championship appearances and came away with a trophy in four of them either as the assistant or as the head coach. The writer is clearly impressed by Martin's work at GVSU as his followup article is a glowing review of Martin's work as head coach the past 6 seasons and a good take on his transition to Notre Dame. As for the rest of the staff, there are rumors that respected OL coach Mitch Browning has been interviewed and a handful of coaches from Cincinnati, including possible defensive coordinator Bob Diaco, will be making the trip to South Bend following the Sugar Bowl, but so far nothing has been publicly announced. 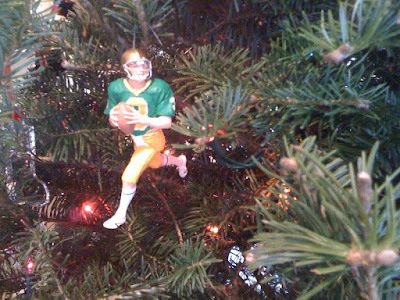 While Kelly is assembling the staff, the players of ND Christmases past, present, and future have all been making news. Departing seniors Kyle McCarthy, Eric Olsen, and Sam Young have all been invited to the 2010 Senior Bowl, one of the major pre-Combine stops on the path to the NFL Draft. The game will be on January 30th with NFL Network providing plenty of coverage. Current star Manti Te'o has announced that he will remain a current player as he intends to return for the 2010 season and forgo his Mormon mission for at least another year. "This was probably the biggest decision that I've had to face in my entire life. I knew the impact of my decision could have a positive influence on those who follow me and those who watch what I do. I always want to have a positive influence on them. I just thought that I was sent to Notre Dame for a purpose and that is a purpose I have to devote to." QB Andrew Hendrix, DE Justin Utupo, and LB Prince Shembo are listed on the roster for the least well known of the January high school bowl games. WR Tai-ler Jones, DT Louis Nix, and recently decommitted CB Toney Hurd, Jr. are among other notable names like Nick Montana in the ESPN hyped newcomer still trying to edge out the US Army Bowl for the nation's best recruits. OL Christian Lombard, LB Blake Lueders, and WR/S Austin Collinsworth (who apparently is injured and will not play) are the three lone commits in what is a quieter than usual year at the US Army Bowl for ND recruits. Still, there are a number of other recruits either still considering ND or at least familiar to ND fans including Seantrel Henderson, Anthony Barr, recent decommit Chris Martin, and Kyle Prater. Quick, name the first player to publicly commit to Ty Willingham and Charlie Weis. The answer for the Brian Kelly era is Kentucky athlete Austin Collinsworth. The son of former NFL player and current NFL announcer Cris Collinsworth, Austin was just offered by Kelly a few days ago and didn't take very long to make his decision. His commit brings the 2010 class tally back to 18 after the decommitment of Texas cornerback Toney Hurd. The recruiting sites don't think much of Collinworth. Both Rivals and Scout have him as a 3-star recruit with Scout also listing him as the 98th overall safety. ESPN is even harsher, giving him 2 stars and the 118th safety ranking to go with his grade of 74. Offers-wise, Kelly offered Collinsworth at Cincinnati months ago, as did Oregon, Stanford, Vanderbilt, Kentucky, and Louisville. While his recruiting rankings are rather low, Austin has been about as successful as one can be on the football field. 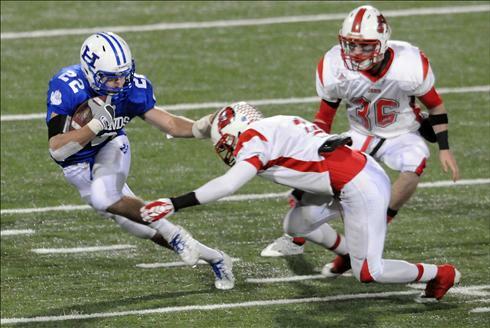 Collinsworth, who helped lead the Bluebirds to three straight Class 5A titles, was an all-state player at three different positions: defensive back, wide receiver and running back. During his three seasons with the varsity, Highlands lost just one game. The Bluebirds are ranked second in the current USA Today Super 25 national rankings. Austin capped off his senior season by being named MVP of the state final after a 176 yard, 3 touchdown rushing performance. He was also invited to participate in the upcoming US Army All-American Bowl, so there will be a chance for him to compete against some of the best talent in the country. From the sound of things, Austin will get his first shot on offense as a slot receiver, so that's were I'll put him for this particular 2010 position depth chart. But he also played safety in high school and ND definitely needs safety recruits in this class so perhaps Austin might find himself moving to the defensive side of the ball in the future depending on how the numbers pan out. Then again, Kelly's offense frequently features four receivers lining up at a time. If Floyd follows in Tate's footsteps and goes pro after a stellar junior season, that would leave only four non-freshman scholarship wide receivers on the roster after the 2010 season. Those trying to divine any particular overall recruiting strategy from the quick offer and commit from Collinsworth might be reaching a bit as it's hard to tell based off this one data point if Kelly will continue to stick with more regional recruits or will reach out nationally for future players. In this instance it appears that Kelly had a player he had recruited previously and thought was a good fit and could add some depth to the current recruiting class. Any long-term recruiting strategies should start to become more obvious after Signing Day when the new ND staff begins to shape and form the 2011 target list. Golden Tate's run of post-season awards has resulted in him becoming the first Notre Dame wide receiver to win the Biletnikoff Award for the nation's best wide receiver and the first Irish Unanimous All-American since Shane Walton in 2002. He's the first offensive player to reach the unaimous status since Aaron Taylor in 1993 and the first WR since Rocket in 1990. The Unanimous status comes from being named to the 1st Team All-America list by the five major post-season award lists: the Associated Press, America Football Coaches Association, Football Writers Association of America, Walter Camp Football Foundation, and Sporting News. Tate is one of 12 players who made the 1st team on all five and earned the "Unanimous" distinction. Tate is the 31st Fighting Irish player to earn Unanimous All-American status, the most of any program in the country. Rather than continue to sign his praises and project his future in the NFL, I thought it might be fun to take a look back when he was a recruit that many weren't sure would wind up at running back, wide receiver, or cornerback. ESPN wins the prediction award as they bucked the "low-4 star athlete" label given by Scout and Rivals and named Tate as the #3 wide receiver in the class and a Top 20 recruit. It was certainly an outlier pick at the time that was used to criticize ESPN's rankings. I suppose they deserve the last laugh here. For an even more interesting look into Tate's recruitment and proof that coaches just weren't sure where he fit , here's an excerpt from Bruce Feldman's book Meat Market, which covered a year of recruiting at Ole Miss under then head coach Ed Orgeron. Many of the evaluation tapes the Rebels would see that morning would be of defensive players or at least prospects they were targeting as defensive players. With the lights dimmed, a red introduction panel appeared on the big screen in front of the room: Golden Tate -- 5'11", 185, 4.4 -- Hendersonville, Tennessee. Every tape was labeled with an intro like this, although about the only things Orgeron took for granted were the kid's name and the town he came from. As for height, weight, and time in the 40-yard dash, Orgeron would believe it when he or a member of his staff measured it. He had seen more than his share of times when high schools and the recruiting services overinflated a kid's dimensions or speed. The Rebels saw Golden Tate as a cornerback. His tape, however, began with a series of dazzling offensive plays. He was juking would-be tacklers, leaving them staggering into each other. He was spinning. He was cutting. He was stopping and starting. His ability to regain top speed, going from first to fourth gear, was startling. 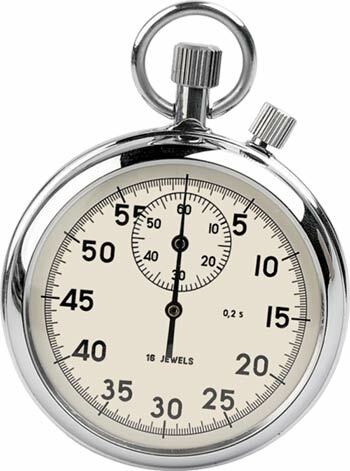 That kind of quickness was critical for a defensive back who had to break on the football after a receiver had made his cut. Tate also was showing go-the-distance speed, running away from everyone on the field. A few other clips displayed that he had good hands and could make catches in traffic. "We sure he's not a running back?" Orgeron asked. "I talked to him," responded Freeze, the coach who recruits Tennessee, "and he says it doesn't matter." Orgeron: "Only thing we gotta figure out is, what's our strategy? I know he says it doesn't matter, but somebody somewhere is going to sell this kid on something." Freeze: "We're one of the first to offer him. But Tennessee's also offered him." Orgeron: "You're not afraid of Tennessee, are you?" Freeze: "No, sir, I am not." This particular excerpt was from Signing Day the year before Tate would ultimately sign with the Irish. ND didn't offer Tate for another 9 months, but it was the offer he was waiting for and he committed to ND a few weeks after receiving it. From there it was the Purdue game in 2007 where he was just told to run past everyone and catch the ball to some amazing catches and runs in 2008 where we all started to see his skill, to this season where no team (or band) was able to stop him. It certainly was a fast three years, wasn't it? And as much as we all wanted him back for another year, probably no one hoped Tate would be back for a fourth more than Kelly. He[Tate] and junior quarterback Jimmy Clausen, another draft early entry, stopped by new Irish coach Brian Kelly's office on Tuesday, not to say they had changed their minds about the NFL but to say hello. “I tried to lock them in my office, but they wouldn't have any part of that,” Kelly quipped. “You know what it said to me was the class both those kids have. Whenever there is a new football coach, it's pretty easy to get caught up in the excitement and promising possibilities given the clean slate of a new coaching staff and feel-good quotes from the press conference. However, in the particular case of Notre Dame football and our recent history of hires, it should be just as easy, and perhaps even a bit wise, to stay jaded and treat everything from now until kickoff in the fall as mostly irrelevant. Personally I fall somewhere in between. I look forward to what Kelly will bring to the program and like what I see so far, yet want to avoid some of the excessive optimism I indulged in when Charlie took over for Ty. Part of that is perhaps a bit of a hangover due to the fact I thought ND was close to landing Bob Stoops (just being honest here), but mostly it's because of the names Davie, O'Leary, Willingham, and Weis. Fool me once, shame on me. Fool me four times in a row, don't expect me to buy your book after your first year. Along those lines, I think some part of Kelly -- or the media consultant he mentioned in his intro presser -- realizes that portions of the ND fanbase are similarly hesitant to "Dive Right In" (if I may reuse one of Charlie's lines). Maybe it's the son of a politician in him, but Kelly seems to be working hard already not only communicating with recruits, but also with the University and fanbase alike in an attempt to spread his ideas for the program and get everyone to buy in. On Twitter alone, "CoachBrianKelly" is responding to individual fan requests and, as far as I know, is now the only coach in the country following the twitter feed of EDSBS. He's also following the BGS feed, which is a bit odd since we basically never use it. In the non-virtual world, he is hitting the sports talk radio circuit and showing up at the Main Building Christmas party to shake hands and take photos with University administrators, not all of whom are big fans of a larger than life football program. Again, gestures like this tend to only convince those willing to be convinced and segments of ND fans will continue to wait until kickoff this September (or maybe November ). And it's easy to show up and work a crowd when you are undefeated. Still, until we start getting more tangible results like the complete make-up of his coaching staff, Signing Day outcome, etc... the "irrelevant" first impressions seem to be that Kelly has a definite plan to handle the coaching transition and it involves being very public and available. Let's see how or if that changes any perceptions over the next few weeks. Within two years, Brian Kelly was the defensive coordinator. Two years after that, he became the head coach when Tom Beck was plucked from the top position to join Lou Holtz's staff at Notre Dame. The dominoes tipped slowly but decisively from that point. As Kelly watched Notre Dame from the distance over the years, he developed favorites — coach Ara Parseghian, quarterback Joe Montana. Picturing Lou on the sidelines reminded me of something. You'll recall the last time Lou put on the interlocking 'ND', for an Irish alumni team that played in the Japan Bowl this summer. Well, they made a behind-the-scenes DVD about the whole experience, and it's really great. First, a little background. The DVD was produced, filmed, and edited by Notre Dame Film professor Ted Mandell. Mandell grabbed a camera and followed the Japan Bowl proceedings from the first organizational meeting; through tryouts, practices, and cuts; and finally all the way to Tokyo for the match. What he's put together is a fantastic documentary that's equal parts football, travelogue, and Irish lore. The DVD follows many of the former players who dusted off the helmets and pads, taped up the ankles, and braved the battlefield one last time: guys like Tony Rice, Melvin Dansby, Joe Restic, Dean Lytle, and Ivory Covington show up for the tryouts, while Chris Zorich, Gary Darnell, Bill Lewis, and Skip Holtz pick up the whistles and clipboards to coach these guys and cobble together a team. There are a lot of aches and pains along the way, and as the practices heat up some of the old bones start to creak. As trainer Kevin Ricks says, "We're doing what we can to hold these guys together. It's going to be a rough week." At one point the guys assemble for a team photo, and realize that the pristine game jerseys don't fit as trimly as they used to. It's hilarious and wistful all at the same time. There are also some wonderful cross-cultural moments once the scene shifts to Japan. The sight of the Irish players disembarking the bus at the Tokyo hotel is made all the more comical by a pint-sized bellhop bowing to each of them as they step off. Ryan Roberts goes shopping for samurai swords at the local market. And the interview Ray Zellars has with Japanese television is straight out of Lost in Translation. Mostly, though, the documentary is a wonderful profile of Holtz in his true element: as a coach, not as a television talking head. Watching it, I couldn't help but think back to 1988, when I was a freshman on campus, and friends of mine on the team would come back from practice alternately laughing at or smarting from the wiry little man with the pipe and the lisp who was building a champion. It was great to see Lou back prowling the sidelines and the locker room in Irish garb one last time, exhorting his charges, cracking wise, and building a team, moment by moment. As Lou himself says on the first day of Japan Bowl practice: "When I walked in here, I didn't realize how much I missed coaching." We miss you too, coach. You can order the DVD (and accompanying booklet, with a few feature stories and player profiles) here. I guarantee you'll enjoy it, and it would make a great stocking stuffer for the diehard Irish fans on your Christmas list. Brian Kelly, a veteran of 19 seasons as a collegiate head coach -- and most recently the architect of two consecutive Bowl Championship Series appearances at the University of Cincinnati, including a perfect 12-0 regular season in 2009 that earned him national-coach-of-the-year honors – tonight has been named the 29th head football coach at the University of Notre Dame. Currently the ninth-winningest active coach in the NCAA Football Bowl Subdivision in terms of victories, Kelly has signed a five-year contract to coach the Irish. He will be introduced at a 1:30 p.m. EST Friday press conference at the Guglielmino Athletics Center. Kelly officially takes over at Notre Dame on Monday; he will not coach the Bearcats in their Sugar Bowl date against Florida. -- Three seasons at Cincinnati from 2007-09, including a 34-6 record (.850) and two straight outright BIG EAST Conference title teams that earned BCS appearances in 2008 (Orange Bowl) and ’09 (Sugar Bowl). -- Three seasons at Central Michigan University from 2004-06, including a 19-16 overall record (.542) that featured a 9-4 mark and Mid-American Conference title in 2006. -- Thirteen seasons at Grand Valley State University from 1991-2003, including a 118-35-2 record (.767) that was highlighted by NCAA Division II national championships in 2002 (14-0) and 2003 (14-1). -- An overall record of 171-57-2 (.747) in those 19 seasons as a head coach. “I am very pleased that a thorough and extensive search has led us to a new head coach in Brian Kelly, who I am confident will help us accomplish our goal of competing for national championships,” said Notre Dame athletics director Jack Swarbrick. Kelly earned the Home Depot National Coach of the Year Award in 2009, was the BIG EAST Conference Coach of the Year in 2007, 2008 and 2009 (the first time a BIG EAST football coach has won the award three straight years) -- and was the American Football Coaches Association Division II Coach of the Year in both 2002 and 2003. Kelly currently ranks ninth among active FBS head coaches in victories with 171. He is the winningest active BIG EAST football coach and the only league coach with more than 150 wins. He boasted a 2-1 record at Cincinnati in postseason bowl games – including a 27-24 win over Western Michigan in the International Bowl after the 2006 season (he coached in that game immediately after taking the job at Cincinnati), a 31-21 win over Southern Mississippi in the Papajohns.com Bowl after the ’07 season and a 20-7 loss to Virginia Tech in the Orange Bowl after the ’08 campaign. Kelly’s ’06 Central Michigan team finished 9-4 and qualified for the Motor City Bowl (Central Michigan defeated Middle Tennessee 31-14, though he did not coach after accepting the head coaching position at Cincinnati) – and his 12-0 team in ’09 earned a Sugar Bowl assignment against Florida. In six NCAA Division II playoff appearances at Grand Valley State, Kelly’s teams combined for an 11-4 (.733) postseason record – including four straight victories in winning both the ’02 and ’03 NCAA titles. His ’01 Grand Valley State team fell 17-14 to North Dakota in the Division II national title game. Kelly’s ’09 team at Cincinnati finished third in the final BCS standings and fourth in both the final regular-season Associated Press and USA Today/ESPN polls. His ’08 team ended up 11-3 and 17th in both polls – and his ‘07 Bearcat squad finished 10-3 and 17th (AP) and 20th (USA Today/ESPN) in the final polls. His 2009 Cincinnati team won all 12 of its regular-season games, led the nation in passing efficiency (166.19), ranked second in kickoff returns (29.2 each) and sixth in total offense (464.25 yards per game), passing yardage (320.33) and scoring (39.83 points). Meanwhile, Kelly’s Bearcat defense rated third nationally in tackles for losses (8.42 per game) and eighth in sacks (2.92). Among the standouts he coached on the ’09 Bearcat roster are first-team All-America receiver Mardy Gilyard (he ranks second nationally in all-purpose yards at 203.5 per game) and quarterback Tony Pike (ninth in passing efficiency at 155.36). Eleven Cincinnati players merited all-BIG EAST honors for ’09 (five first-team selections), including Gilyard, the league’s Special Teams Player of the Year for the second straight season. In three years at the helm of the program, Kelly put together a 34-6 record and led the Bearcats to their first two BIG EAST Conference championships in 2008 and ‘09. Cincinnati achieved a then-school-record 11 victories in 2008, followed that up with a dozen wins in ’09, and had back-to-back-to-back 10-win seasons for the first time in school history. Kelly’s Bearcats in ’08 won the school's first outright conference championship since 1964, and earned the school's first berth in a BCS game, playing against Virginia Tech in the 75th FedEx Orange Bowl. In ’08 Cincinnati achieved its then-highest ranking to close the regular season – 12th in the AP and USA Today/ESPN polls and the BCS standings entering the Orange Bowl. The Bearcats held down a postseason ranking of 17th in both polls, tying the top postseason ranking in school history and marking the first time Cincinnati was ranked in the end-of-season polls in school history. Following the close of the ’08 regular season, Kelly was named the BIG EAST Coach of the Year for the second straight season. He also was named the American Football Monthly Schutt Sports FBS Coach of the Year, earned AFCA Region 1 Coach of the Year honors and was named BIG EAST Coach of the Year by Sporting News. Cincinnati placed 10 players on the 2008 all-BIG EAST teams (including first-team selection Connor Barwin) – with kick returner Gilyard named the BIG EAST Special Teams Player of the Year and punter Kevin Huber earning the first AFCA All-America nod in program history. Huber became the first two-time AP first-team All-America selection in Bearcat football history. The Bearcats' 27-24 bowl victory over Western Michigan in 2006 came just 34 days after his hiring. Then, in his first full season at the helm in ‘07, Kelly put the Bearcats on the national radar by jumping out to a 6-0 start and earning the Bearcats their first appearance in the polls in more than 30 years. By winning 10 games for the first time since 1951, the Bearcats earned their 10th bowl appearance in program history and sixth bowl appearance in eight years. Cincinnati finished 17th in the AP poll, earning its first appearance in a final poll. Along the way to the 2007 Papajohns.com Bowl victory, the Bearcats’ third straight bowl win, Kelly earned BIG EAST Coach of the Year honors. Cincinnati listed seven individuals on the all-BIG EAST teams, including BIG EAST Special Teams Player of the Year and consensus All-America punter Huber. The national leader in punting, Huber was one of three Bearcats to be named to an All-America team. Cincinnati ranked second in the BIG EAST and 24th nationally in passing offense (254.1), and was also second in the league and 27th nationally in passing efficiency (139.4). At the same time, the Bearcat defense led the BIG EAST in sacks (2.9) and tackles for a loss (6.5). Kelly’s Bearcats led the NCAA Football Bowl Subdivision (FBS) in net punting with an average of 41.5 yards per punt. Cincinnati also led the BIG EAST in kickoff returns (24.2). During his three years at Central Michigan, he transformed a Chippewa program that had won more than three games only once in the past four seasons into a conference champion. Central Michigan posted a 9-4 record in 2006 en route to winning the MAC title and qualifying for its first bowl game in 12 years. Kelly inherited a program that had produced a mere 12 wins over its previous four seasons when he took the helm at Central Michigan in 2004. He guided the Chippewas to a 4-7 record in 2004 and a 6-5 slate -- the school's first winning season in seven years -- in 2005. The Chippewas in 2005 defeated both defending MAC divisional champions, Miami and Toledo, and also knocked off eventual ‘05 league champ Akron. Central Michigan was ranked 35th nationally in total offense and 26th in passing offense while the team's rushing defense was ranked 20th (while leading the MAC at 113.7 yards per game, compared to 245.8 in ’03 -- the year before Kelly arrived). Kelly's 2006 Chippewas lost non-conference contests to bowl-bound Boston College and Kentucky by a combined 16 points. Central Michigan rolled up a 7-1 record in conference play to win the MAC West, then dominated Ohio 31-10 in the league championship game. Central Michigan boasted the 19th-most prolific passing attack in the nation, averaging 252.4 yards per game, and was ranked 31st in total offense (380.2 yards per game) and 24th in scoring offense (29.6 points). Quarterback Dan LeFevour, a freshman who passed for 2,869 yards and 25 touchdowns, was ranked 20th in passing efficiency and 14th in total offense. Kelly had 12 of his players achieve first-team all-conference honors over his three years at Central Michigan (including ’05 MAC Defensive Player of the Year Daniel Bazuin) -- and three advanced to the NFL (including 2005 draftees Eric Ghiacuic and Adam Kieft and free agent Tory Humphrey). Kelly arrived at Central Michigan after winning the back-to-back NCAA Division II national titles at Grand Valley State. The Lakers were 41-2 in Kelly's final three seasons, at one point winning 32 consecutive games. Grand Valley State went 14-0 in 2002 en route to its first national title and was 14-1 in 2003 when it claimed its second crown. Kelly was named the AFCA Division II Coach of the Year after both seasons. Kelly led the Lakers to five conference titles and six Division II playoff appearances in his 13 seasons at Grand Valley. The Lakers never finished lower than third in the Great Lakes Intercollegiate Athletics Conference. Kelly mentored a pair of finalists for the Harlon Hill Award, presented annually to the top player in Division II. Curt Anes won the award in 2002 after finishing as runner-up in 2001, while Jeff Fox was third in the balloting in 1998. Both players were quarterbacks in Kelly's system. Kelly's Grand Valley State players earned 77 All-America awards (11 in 2002 alone). Four players moved on to the NFL and another three to the Canadian Football League. His 2001 national runner-up squad set 77 NCAA, GLIAC and school records, including the all-time Division II scoring record by averaging 58.4 points per game. The 2001 team also became the first Division II unit in 53 years to average more than 600 yards per game in total offense (600.8). Grand Valley State followed up its record-shattering 2001 season by averaging 497.5 yards and 47.0 points during its undefeated 2002 national championship run (that ended with a 31-24 championship game win over Valdosta State) The 2003 team, meanwhile, was more noted for its defense. The Lakers defeated North Dakota 10-3 in the 2003 national title game. In 10 of his 13 seasons at Grand Valley State, Kelly’s teams won eight or more games – and he finished with a 103-22-2 mark in GLIAC contests. Born Oct. 25, 1961, in Everett, Mass., and raised in Chelsea, Mass., Kelly attended St. John's Prep School in Danvers, Mass. He was a four-year letter-winner at Assumption College (Worchester, Mass.) as a linebacker, captaining the squad in both ’81 and ’82 under coach Paul Cantiani on teams that finished 8-3 and 7-1-1. After graduating from Assumption in 1983 with a bachelor's degree in political science, he served as linebacker coach, defensive coordinator and softball coach from 1983-86 at Assumption under head football coach Bernie Gaughan. Kelly joined the Grand Valley State staff in 1987 as a graduate assistant and defensive backs coach. 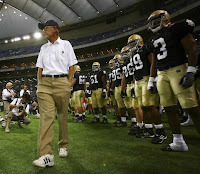 He became the defensive coordinator and recruiting coordinator in 1989 and took over as head coach in 1991 (replacing Tom Beck, who left to become running backs coach at Notre Dame under Lou Holtz). His very first team Laker team finished 9-3 and qualified for the NCAA playoffs. In 2009 Kelly was inducted into the Grand Valley State Athletics Hall of Fame. Kelly has served on the AFCA Ethics Committee – and he’s currently one of 59 FBS head coaches who vote in the USA Today poll. Kelly and his wife Paqui are parents of three children – Patrick, Grace and Kenzel. Making it even more official. SOUTH BEND — The search is finally over. According to two university sources familiar with the search process, University of Cincinnati head coach Brian Kelly will be named Charlie Weis' successor at Notre Dame. Kelly is expected to meet with his team Thursday night before the Bearcats' football banquet to inform them of his decision. The media were suddenly banned from the banquet Thursday afternoon. Kelly, 48, is 34-6 in his third full season at UC. He is 160-54-2 in his 19th year of coaching at Cincinnati, Western Michigan and Grand Valley State. Weis was officially fired Nov. 30 following five seasons with a 35-27 record. I'm sure there is something snarky to write about either the name recognition of Kelly's former employers or the quality of modern day journalism that the SBT wrote "Western Michigan" instead of "Central Michigan" under Kelly's bio, but I'll pass. Instead, I'll give Kelly the same greeting I gave Charlie Weis. Coach Kelly, welcome to Notre Dame. There are 268 days until the first game. Get cracking. We've been down this path before, but now that it's being reported that tonight's Cincinnati football banquet is keeping the media on the outside, it's becoming more and more likely that Kelly will be announced (or leaked) as ND's newest head coach very soon. The theory is that Kelly gets some time away from twittering journalists to break the news to his team and very soon thereafter the horse is out of the barn, so to speak. But until that hits the mainstream, we still only have rumors and suggestions from the media, friends, and former co-workers of Kelly. When Kelly took two Grand Valley teams to NCAA Division II championships this decade, Martin was his defensive coordinator. Kelly left to become coach at Central Michigan, then Cincinnati. At each stop, he called Martin about coaching his defense, but Martin opted instead for winning his own pair of national titles, and could add a third Saturday. 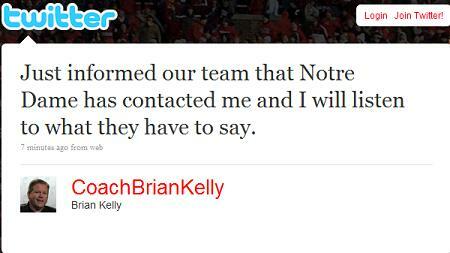 If Kelly calls next from Notre Dame, don’t expect the same answer. “No, I wouldn’t turn that down,” Martin said. “But I’ve turned down D-coordinator at Central and D-coordinator at Cincinnati. He may be done asking me. It certainly is odd seeing people lobby in the press for a an assistant spot under a coach that hasn't been officially hired yet. Even more odd to see a head coach with a 74-6 career record and two national championships admit he'd take a coordinator position under his old boss. The closer to the end of this search we seem to get, the more strange twists and turns we see. While ND is still looking for their new head coach, the coach temporarily in charge of the program has moved on to a more permanent job title. The University of Akron introduced Rob Ianello as their head coach this afternoon. ''My lifelong dream has been to run a football program at the highest level, and there is no better place to begin that journey than right now at the University of Akron,'' Ianello said. Ianello joins Mike Haywood as former Charlie assistant coaches now running their own MAC conference teams. His career path towards becoming a head coach seemed apparent when he was named assistant head coach (offense) for ND at the beginning of this season, but he still is in the small club of head coaches who have never been a coordinator before. Good luck to Rob and his family in the future. Hopefully his future is more like the last wide receiver coach to leave ND for his own head coaching gig in the MAC rather than the last ND coach to leave South Bend and take a job at Akron. The impact of the move on ND depends on how quickly the program can land a head coach. Ianello was running the recruiting operation and the sooner his duties can be handed off to the guy who will be coaching the players next season, the less chance for doubt and whispers from other coaches to sway the currently committed and interested players. There still might be a few bumps in the recruiting road ahead though as losing the man in charge organizing recruiting (and that includes current juniors and sophomores as well) tends to result in a few names slipping through the cracks. Coaches like Brian Polian and Tony Alford are now that much more important for keeping the recruiting plan in place during this time of transition. You may notice we haven't been throwing up every rumor that hits the wire this coaching search, unlike five years ago when we documented the media mentions of Meyer, Hawkins (hey, I actually got something right! ), Shanahan, Alvarez, Fassel, Petrino, Magino, and ultimately, Charlie Weis. Part of the reason is time, but part of it is that we learned our lesson about running after every rumor that hits a message board. To be fair, it can be entertaining (more so in retrospect) and Keith over at Inside the Irish has done a fantastic job detailing the day to day ups and downs. But ND fans could sue for whiplash with the way that rumors have jumped up and then suddenly reversed course the past few days. One of the perfect examples of this has been the involement of Twitter to the latest ND coaching search. Poised to become the 2009 equivalent of 2001's Flight Tracker, fans are monitoring twitter accounts for even faster and less relaible rumors than those that show up on message boards or media blogs. The events of Tuesday highlighted just what is fascinatin, and at the same time, maddening, about the latest social media tool being used by coaches who still don't all understand it. Let's look at the timeline. Kelly mentions on Monday that he will talk with Notre Dame. ESPN's Joe Schad, via Twitter, and other sources mention on Monday that Kelly will interview with Notre Dame in NYC on Tuesday. On Tuesday, Kelly denies any sort of interview via Twitter. Kelly then puts up a picture of himself (and a Tiger Woods ad) and asks if anyone knows of a good NYC deli. UC's Director of New Media and Broadcasting warns that Kelly's Twitter account has been hacked and it hasn't been him sending out the odd tweets. Just over two hours later, Gelehrt retracts his statement and confirms that it was in fact Kelly looking for a good reuben sandwich. ND fans wonder just what is going on. A couple of the major issues facing Twitter as it attempts to become even more ingrained in our business culture is their verification process and the security of a medium that is instant and removes nearly all of the normal media or lawyer buffers prevalent in big business. But that's more of a topic for a new media blog. The focus here is that nature still abhors a vacuum, especially during a coaching search and Twitter has added to the cacophony of voices all shouting conflicting reports at the same time. The message here remains the same. Don't believe what you read on the internet. (except that last sentence. You can believe that one) and sit tight. There are still too many rumors (now with 50% more Edsall!) and not enough people who actually know what is going on talking. Conventional wisdom is that ND is close to a decision, but conventional wisdom doesn't bat 1.000% during Notre Dame coaching searches. I just wonder which Twitter account will finally break the news of our new coach when it doesn happen. I have a longer post in draft mode summing up some of the weekend's news, but this seems to trump most of that. There is one logical reason why a coach would put something like that on Twitter; he knows what Notre Dame is going to say and he knows what his answer is going to be. In all likelihood, it's just a matter of time until this is official. Here's an object lesson in how rumors get started, and how quickly they spread in the internet age. 1. 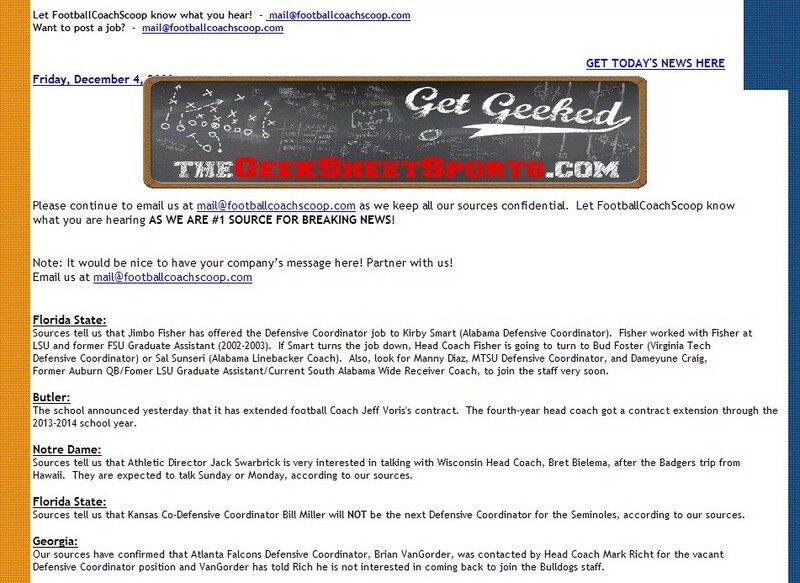 Friend of BGS decides (not at our behest, by the way) to email the rumor site FootballCoachScoop.com with a choice tidbit. FootballCoachScoop seems to post all kinds of unsubstantiated rumors, and said friend wants to see how easy it is to get something started. 2. Friend composes a very short, but specific email: I used to work in the athletic department at Notre Dame (a lie), and I have heard that Jack Swarbrick is interested in Bret Bielema, the head coach at the University of Wisconsin. This was at 6:56pm last evening. The email is sent from a free gmail account. There is no other email sent from friend, no attempt to "sell" the rumor beyond the initial communication, and nothing else to back up his credibility. 3. Meanwhile, friend has another buddy randomly tweet a few times about the Bielema rumors, and goes to bed. 4. FootballCoachScoop does not reply to the email. FootballCoachScoop does not ask any followup questions. FootballCoachScoop, to friend's knowledge, makes no attempt to verify emailer's bona fides in any way. 5. The next morning, FootballCoachScoop runs the rumor almost verbatim. Friend chuckles and shares the development with a few friends. Another day, another new name has surfaced in the Notre Dame head coaching search. According to FootballCoachScoop.com, Irish AD Jack Swarbrick is "very interested" in talking to Wisconsin head coach Bret Bielema, after the Badgers trip from Hawaii this weekend. Bielema's name has not been mentioned in prior discussions about the Notre Dame opening. He joins a list of reported candidates that includes Jim Harbaugh (Stanford), Skip Holtz (ECU), Randy Edsall (UConn), and Brian Kelly (Cincinnati). Bielema was an assistant coach at the University of Iowa from 1993 to 2001. He then became the co-defensive coordinator for Kansas State University from 2002 to 2003. He took the same position at the University of Wisconsin–Madison in 2004. The Wisconsin coach joins a chaotic rumer mill surrounding the Irish head coaching void left by the firing of Charlie Weis. Most expect answers to many of the questions surrounding the search after this weekend, the last regular-season weekend before bowl games begin. "Examiner" posts have sometimes popped up in my google reader, linked alongside legitimate news stories from legitimate news outlets. I wonder if it will show up. UPDATE: voilà, there it is. This is now on a national newswire. In the meantime, please know that to our knowledge, there is absolutely no truth to the rumor that Jack Swarbrick is in any way interested in Bret Bielema as the next coach for Notre Dame. And please, most of all...don't trust the internet! UPDATE II: John Taylor, blogging for NBCsports.com, picked up the rumor from FootballCoachScoop, but then realized it was a goof, and printed a pretty entertaining retraction. UPDATE III: This is officially hilarious. A Madison.com reporter, Jim Polzin, picked up the FootballCoachScoop rumor and actually tracked down Bielema in Hawaii for a statement. He also called Wisconsin athletic director Barry Alvarez. Both men, of course, had no idea what Polzin was talking about and denied any contact between Notre Dame and themselves. UPDATE IV: Polzin catches on, and updates his story with a link to this post. In the meantime, ESPN blogger Adam Rittenberg has also published the rumor but quickly retracted it. Okay, enough rumor-busting for the evening. Have a great weekend, everyone. Charlie has been understandably quiet since his dismissal, and until he speaks to the media, it's hard to guess what he might say in a farewell address. In the meantime, the South Bend Tribune reported some recent Charlie quotes via WR commit Daniel Smith. You get to the point where you don't want to answer your phone,” the Northern Indiana Conference Player of the Year said. “But when I saw it was him, it was just great to hear from him. I tried to thank him for putting me in the position I am today. It had to have been pretty hard for Charlie, a prideful guy to begin with, to be dismissed from his alma mater. Hopefully the kinds of things he said to Smith are similar to what he'll say when the microphones are in front of him. Congrats are in order for Golden Tate, who was just named to the AFCA All-America Team. He's the first ND player to make the list since Shane Walton and the first offensive player since Aaron Taylor back in 1993. The last wide receiver to make the list was Rocket back in 1990. Here's the AFCA press release and list of the players who made the team. OL Russell Okung 6-5 300 Sr. Oklahoma St.
DL Jared Odrick 6-5 296 Sr. Penn St.
LB Greg Jones 6-1 228 Jr. Michigan St.
With the rest of the All-America lists coming out in the next week or so, Tate is probably a good bet to lock up Consensus All-America honors, joining Jeff Samardzija. Meanwhile, Clausen was named one of 10 finalists for the Manning Award. As the Manning Award prides itself on being the only quarterback award that takes a candidate's bowl performance into account, it's probably a safe guess that Clausen won't win this one. Still he should be in contention for some of the other quarterback awards as well as possible inclusion on a few All-America teams. Sadly, if you're anything more than a very recent fan of Notre Dame, you have some experience when it comes to coaching searches. The rumors, the "inside sources", the numerous front page articles about how ND is no longer relevant, etc... Still, even with all our accumulated experience and knowledge about how all that matters is the end result, you can't help but get anxious the longer a coaching search stretches out. Granted, ND has only been at it publicly for two days now, so anyone freaking out at this point should be in the market for rubber sheets. But with tweets like this one suggesting the search could stretch on for another week or so, anxiety will likely be rising around the Notre Dame fan nation. With that in mind, we decided to take a look at what the usual wait is for a program needing to replace their head coach. A tip of the cap to collegefootballpoll.com for having most of the information already at hand. We tallied up the open job duration for all 97 head coach searches since the 2004 season and found that the average number of days to fill a vacancy is 18.2 and the median number of days is 15. These numbers are impacted a bit by the extremes at either end so here is some more context on the 10 shortest and 10 longest searches over this time frame. First, the short searches. The first thing you notice is that the easiest way to have a quick coaching search is to just promote an assistant. Whether this is pre-announced, as was the case for Wisconsin, Indiana, and Purdue, or just done on the day of the change, as was the case for Oklahoma State, Boise State, Army, and Navy, you can end your search as soon as it begins. Likewise, when the head coach gives you a heads up that he plans to retire, as with South Carolina, you can get his replacement ready to go in short order as well. The last two cases show that a quick search doesn't mean it's a good one, as Dennis Erickson jumped away from Idaho as quickly as he could and Louisville just fired Kragthorpe after only three seasons. Now let's look at the long searches. With Notre Dame not falling into easy categories of internal promotion or mid-season firing, what's an expected amount of time until the new coach is announced? Thanks to help from Jay, Jeff, and BGS friend Mike S., here's the complete listing of every coaching search from 2004 to 2009, how long it took, and assorted other analytical breakdowns of the numbers. Looking at the end of November dates, the average is actually pretty close to the overall average, with most searches on those days taking around 15 days or so. For the sake of our sanity and our production at work, let's hope this one doesn't stretch on much past that.